Regular readers will know that Moment is my go-to place for tea and cake, but even I like a change sometimes. 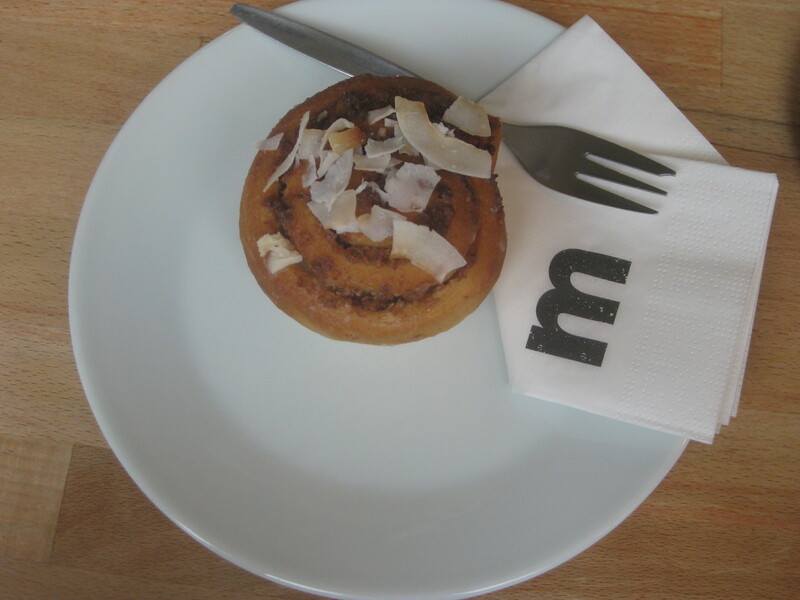 Enter Mamacoffee, a charming vegan-friendly chain of cafes across Prague. The Londynska branch is my favourite, though it is a seasonal destination for me: there are only a couple of indoor tables, so you need the right weather to enjoy the garden seating. It’s a teeny tiny place, but they have good tea, coffee and hot chocolate (vegan if you ask for non-dairy milk) and always one vegan baked good on offer. 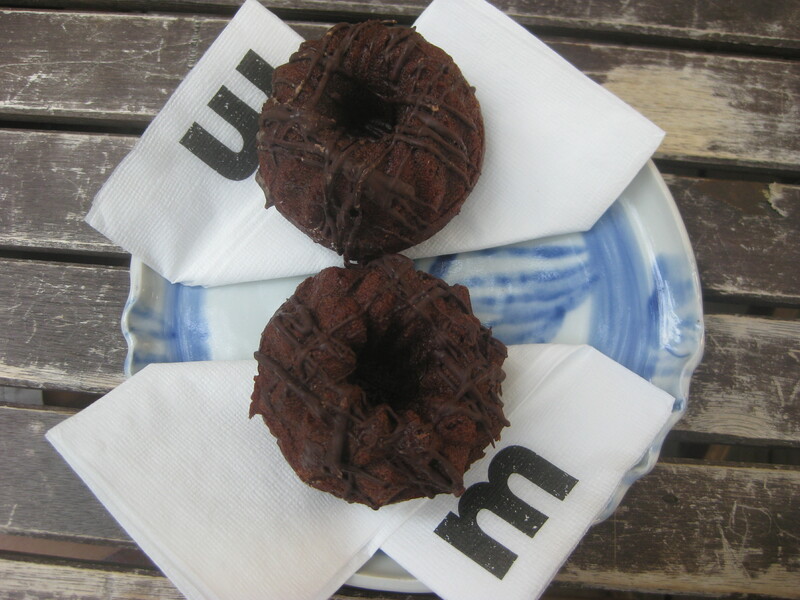 This chocolate bundt cake is usually in, and it’s very good. They also sometimes have this banana bread, with a delicious chocolate topping. Both of these cakes are fairly light and make a very enjoyable elevenses, I have to say. The Vodickova branch, closer to the city centre, is more of a restaurant upstairs with a cafe downstairs, and it tends to be quite busy – the first two times we went we couldn’t get a table upstairs. We managed to find a seat in the cafe downstairs on one of those occasions, at least. 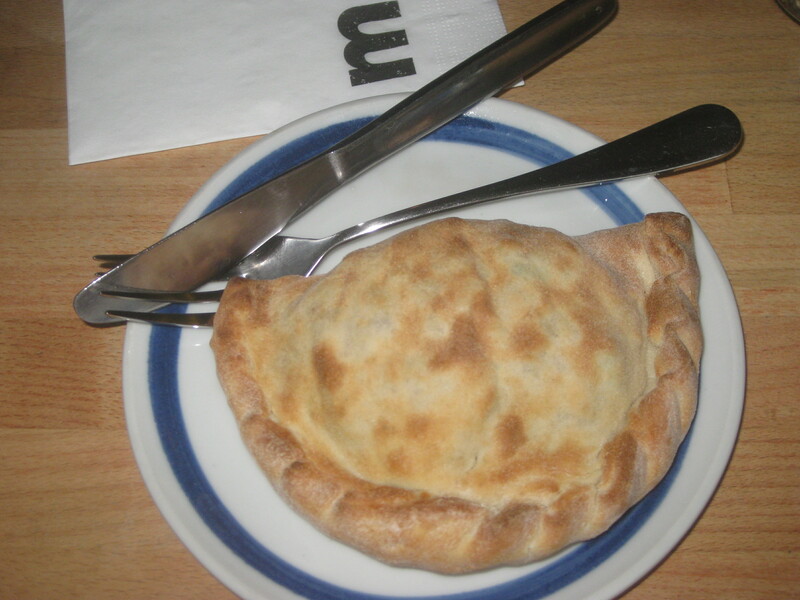 Dr HH and I both ordered the one savoury vegan option, a savoury turnover which was something between a pasty and a calzone, with a samosa filling. It took about ten minutes for the staff to warm this up in the oven and bring it over, and the time:heat ratio left something to be desired. It was tepid at best – we might as well have just had it immediately at room temperature. At least it tasted good though! There were four vegan dessert choices: the aforementioned chocolate bundt and banana bread, plus apple strudel and these pumpkin coconut cinnamon rolls. We couldn’t detect any pumpkin, but the dessicated coconut rolled up inside was a great touch. They were room temperature, and lacked the usual stickiness of a cinnamon roll, but again, they tasted fantastic and we really enjoyed them. On our third attempt and with a reservation this time (phone reservations only, more’s the pity), we finally got into the upstairs section for a proper lunch in March. 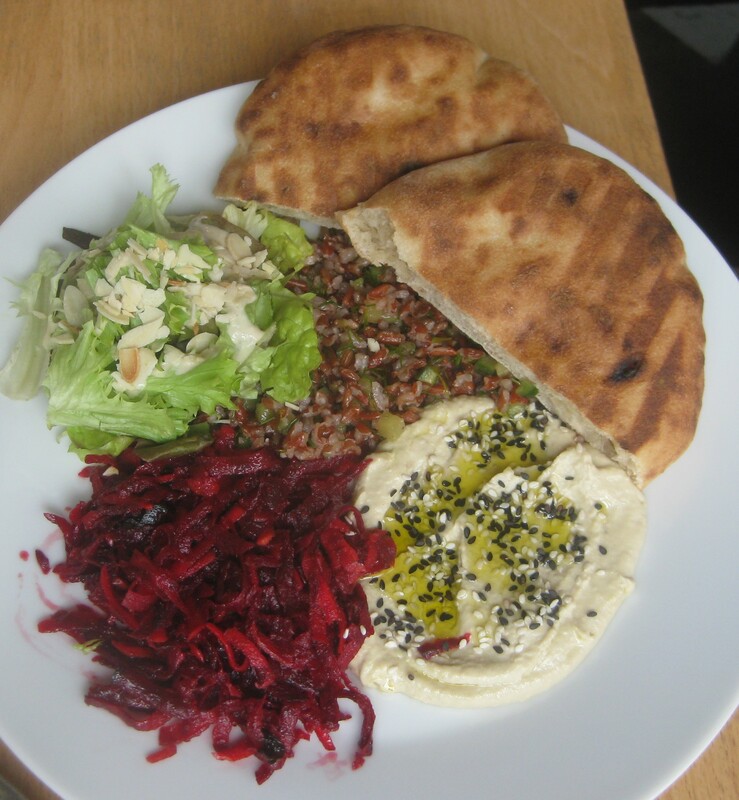 The vegan and veganisable options are clearly marked on the menu, which is in both Czech and English. 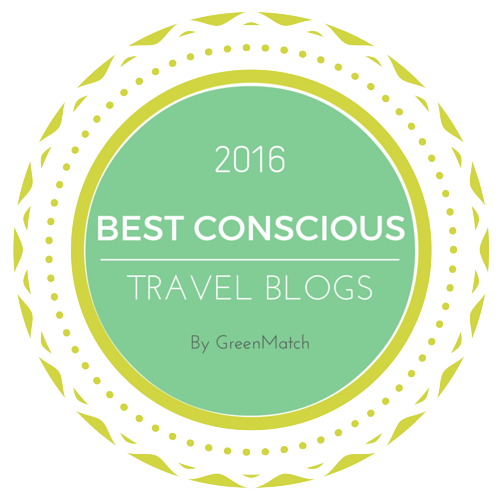 There are a couple of vegan breakfast options, and most of the lunch options are vegan-friendly too. 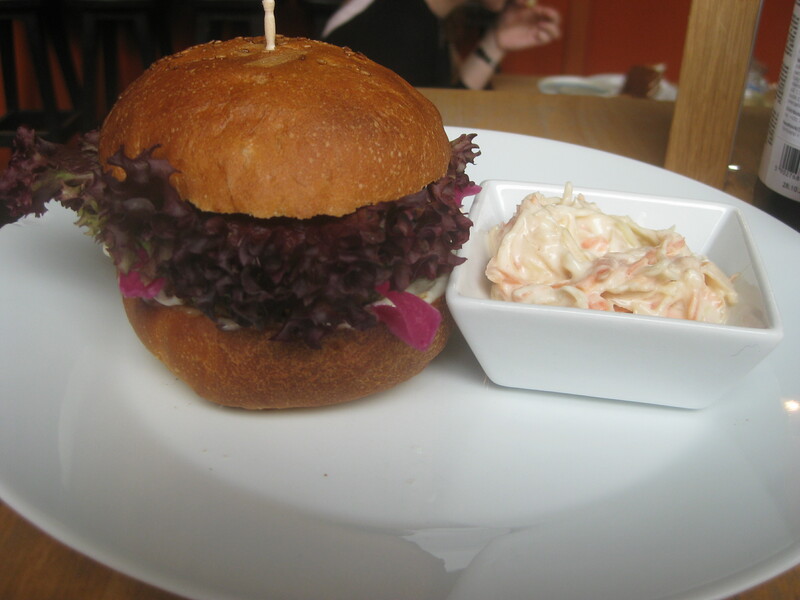 Dr HH had the burger, which came with a little pot of coleslaw. It had a vegetable patty with some mayo and a delicious bread bun. It wasn’t the best burger he’s ever had, but he was pleased with the flavours and textures. My brother was with us, and he had the mezze plate, which certainly looked good. 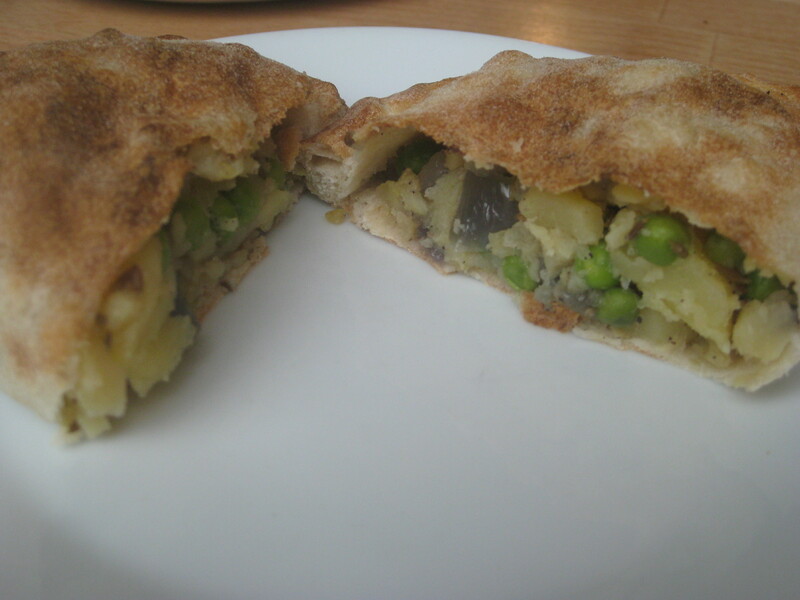 He raved about the pita pockets, and was also delighted with the hummus and rice salad. Well done Mamacoffee for winning over a non-vegan! 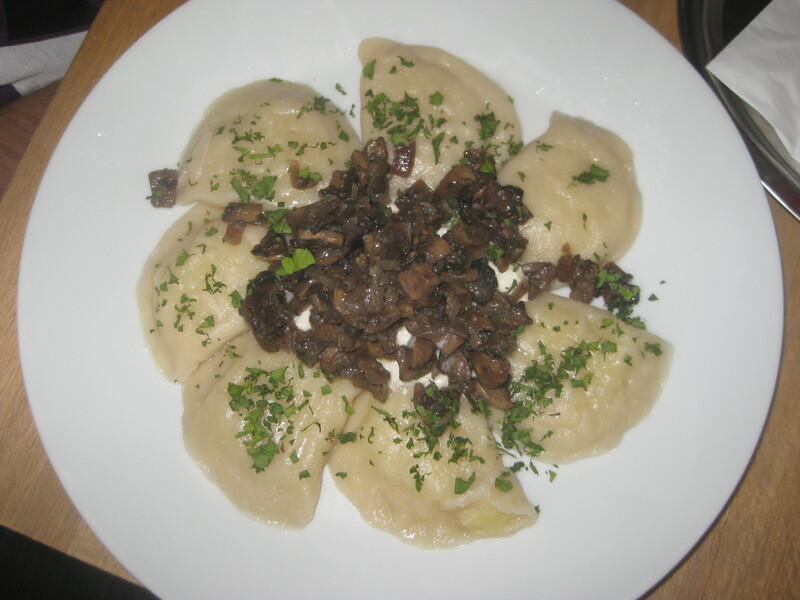 And I got the veganised Ukranian dumplings with potato and mushrooms. They were filled with mashed potato, and topped with sour cream and mushrooms, and they were delicious! I’d highly recommend them. It’s the kind of dish I haven’t really seen elsewhere in Prague. 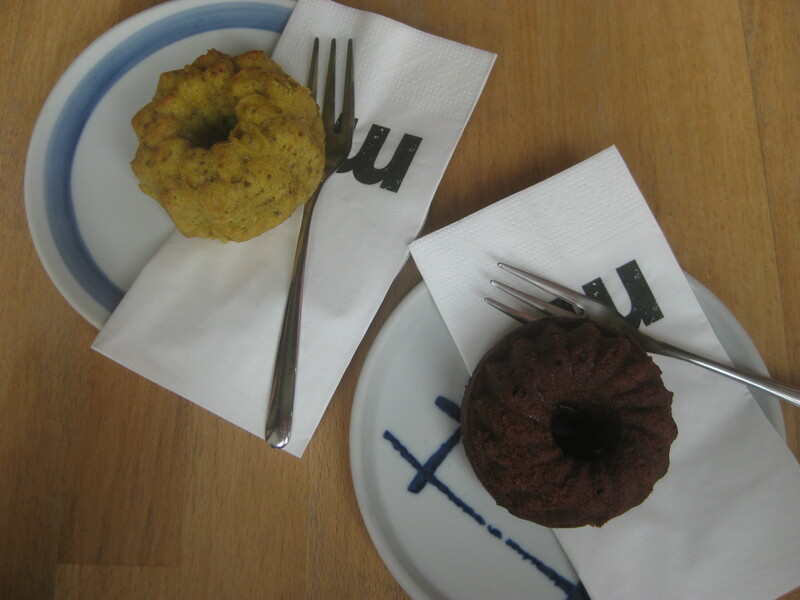 We finished off with a couple of cakes: the chocolate bundt again, and a lemon and chia seed one which was really zesty and light. If there are no vegan cakes in the upstairs cabinet, definitely ask the staff and they can let you know what the options are downstairs. The best thing about this particular branch of Mamacoffee is that it is directly opposite one of Prague’s Hooters restaurants. Yes, that Hooters. Not only do you get to have a tasty and civilised light lunch, you also have the entertainment of watching hungover, remorseful-looking stags hiding behind their sunglasses as they stumble in and out. Classic Prague entertainment! 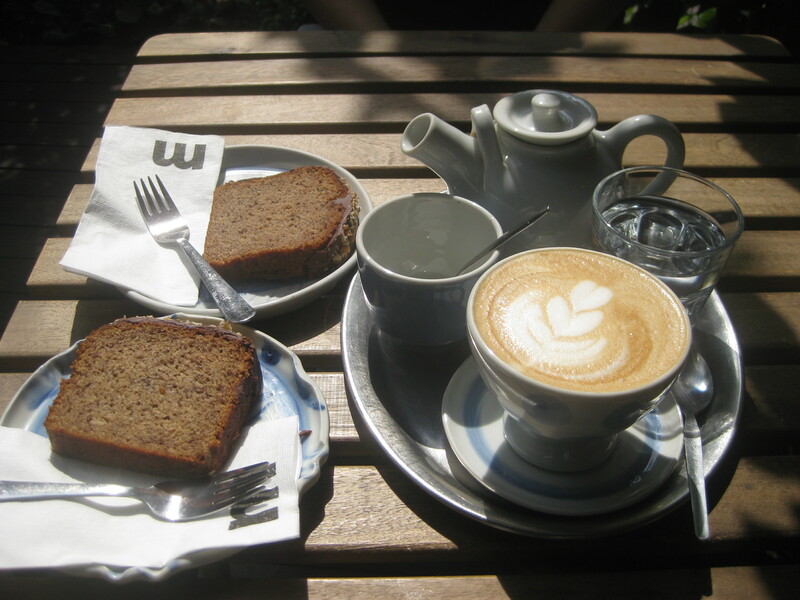 This entry was posted in Travel and tagged Mamacoffee Prague vegan, vegan cake, vegan Prague, vegan travel. Bookmark the permalink. You had me at vegan chocolate bundt cake, but I’m even more convinced about the joys of this chain when you got down to the dumplings. You can never have enough dumplings in your life. It’s true! The Czech Republic is a great place for dumpling fans, but I don’t spot many vegan ones like this. Those Ukrainian dumplings look amazing. Potatoes are made to be stuffed into bread.